Your gums are the foundation of your smile. When your gum health suffers, your teeth and your overall health are at risk. At ConfiDenT, we value the importance of top quality periodontal care. We take measures to protect the health of your gums and monitor them closely if issues arise. Our dentists bring deep experience and training in periodontal treatments. Whether we are reversing the first signs of gingivitis or treating advanced periodontitis, you can trust that we have the dental services to restore your gums back to health. When the gums become irritated, inflamed or infected, treatment should be initiated promptly. Untreated gum disease is not only the leading cause of tooth loss but it has also been linked to systemic health conditions such as diabetes, stroke, premature birth and more. 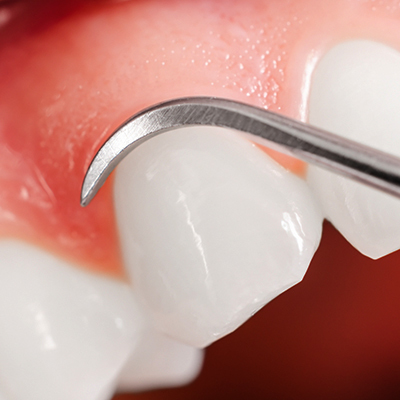 At its most advanced stage, gum disease is called periodontitis. At ConfiDenT, we offer a variety of ways to treat periodontal disease, including deep cleanings for mild to moderate gum disease as well as cutting-edge laser assisted treatments for advanced periodontitis. Our modern dentists and equipment allow us to effectively address all stages of gum disease without stitches or surgery! Understanding the symptoms and causes of periodontal disease is the first step towards preventing this serious oral health condition. Gum disease is an infection that can eventually cause destruction of the tissues, fibers and bone that support your teeth. It often begins with poor oral hygiene or when food particles, plaque and bacteria are not properly removed with brushing, flossing and routine dental cleanings. As plaque hardens along the gum line, it causes irritation and inflammation of these supporting tissues. The gums may start to pull away from the tooth root and form deep pockets of tissue that harbor bacteria and aggravate the infection. If you are experiencing signs of gum disease, contact our periodontal therapy experts at ConfiDenT Dental in Alpharetta. We can restore your gum health and help you avoid the serious drawbacks of periodontitis.